One thing many of us find is that with all that we try to fit into our busy days, our energy levels tend to drop. Your first instinct might be to reach for an energy drink or put on a pot of coffee, but those will cause an energy crash, making you even less energetic than you were before. Not only that, but they’re likely filled with sugar, which can have negative effects on your health. What else is there? We’re glad you asked! Nature’s Energy is the maker of Liquenergy, an all-in-one dietary supplement that’s caffeine-free and contains organically sourced minerals as well as select natural ingredients. It’s packed with fruits, vegetables, and nutrition that can help you achieve the energy you crave. We’ve designed this energy boost supplement to be highly absorbable to make it easier for your body to use the nutrients. Remember to speak to your healthcare provider before you start taking any vitamins to boost energy. Here are some healthy energy boosters to consider. B vitamins come in eight forms, and can perform a number of functions in the body. The body doesn’t store B vitamins very easily, so getting enough of these nutrients through nutrition or supplementation could be in order. Stress, drinking alcohol, smoking, and not getting enough sleep all require a higher level of B vitamins. Here are some of the types of B vitamins and what role they play in your health. B1: Thiamin – Vitamin B1, or thiamin, is a key nutrient in metabolism. It also supports the kidneys and adrenal glands, and the nervous system. B2: Riboflavin – Vitamin B2, otherwise known as riboflavin, is a powerful antioxidant that promotes the functions of the other B vitamins. It can help prevent cancer and control free radicals in the body. B3: Niacin – Vitamin B3, also known as niacin, promotes healthier heart function, and can lower LDL cholesterol (bad) while raising HDL cholesterol (good). Some have found it effective in reducing asthma symptoms, and preventing Alzheimer’s. B5: Pantothenic Acid – Vitamin B5 is also known as pantothenic acid, and is critical to metabolizing macronutrients (fat, protein, carbohydrates). It breaks down fatty acids, and makes skin look healthier. B6: Pyridoxine – Vitamin B6, or pyridoxine, is necessary for producing neurotransmitters. It is also a component in the treatment of PMS, arthritis, depression, diabetes, memory loss, ADHD, lung cancer, and acne, among others. B7: Biotin – Vitamin B6, also called biotin, is mostly known for promoting healthy skin and nails. However, it also can help maintain blood glucose levels, and reduce insulin resistance. B9: Folic Acid – Vitamin B9 is also known as folic acid and aids in human growth, starting at conception, and also can reduce the risk of strokes and heart attacks. It has also been shown to prevent certain cancers as well as age-related decline in memory. B12: Cyanocobalamin – Vitamin B12, or cyanocobalamin, maintains red blood cells, and is necessary to producing genetic material and neurotransmitters. Liquenergy contains all the B vitamins. One of the functions of the circulatory system is to carry oxygen through the body via red blood cells. Without this oxygen, you’ll see a dip in energy, as well as dizziness, headaches, change in mood, and pale skin. Iron plays a critical role in this. Iron aids in the production of red blood cells, and can help with the symptoms of anemia. Sunlight naturally produces vitamin D in the body, but many of us work indoors and don’t have enough vitamin D as a result. It becomes especially troublesome when the time changes in the winter and the amount of daylight people get becomes shorter. When enough vitamin D can’t be gained through sunlight and diet, supplementation might be warranted. Vitamin D aids in the function of mitochondria, which energizes our cells, and can provide a nice energy lift. You probably think of vitamin C, and immediately your thoughts go to its role in healing. You might already pop a vitamin C tablet when you notice a cold coming on. But did you realize its role in your energy? 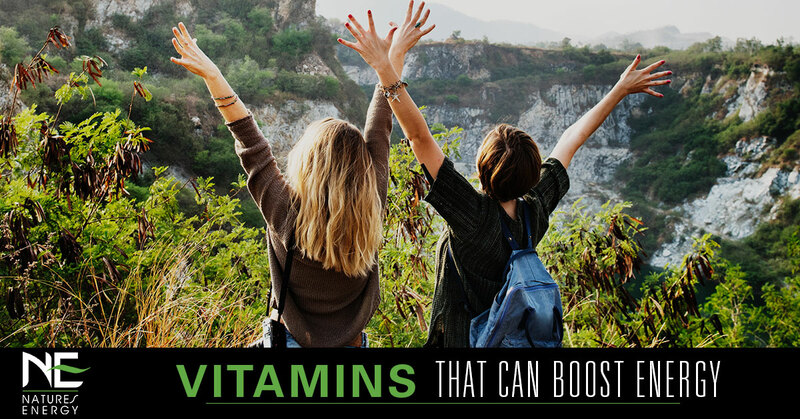 While it’s not directly responsible for boosting energy, its role in healing and boosting your immune system indirectly affect your body’s energy levels. In our next post, we’ll cover minerals that boost energy, so stay tuned! For an all-in-one energy boost supplement, try Liquenergy by Nature’s Energy. It’s full of fruits, vegetables, vitamins, and minerals, and it’s caffeine-free. Get yours today!